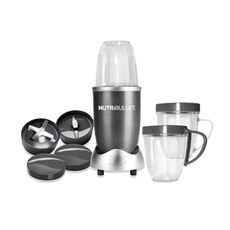 This is a quick, on the go juicer/blender that breaks down fruit and veggies to extract the max amount of nutrients so that your body can absorb it even faster. When I first began to eat clean, I was not a big fan of vegetables. I could handle fruit, but was definitely not getting the amount that my body needs. So my nutritionist told me about juicing or blending my fruits and veggies. I have a Ninja that also serves as a blender in my home, so that is what I use. But, if you need something quick on the go, throw your fruits and veggies in a cup, tighten the lid, place it on the blender, once done, remove the lid and done. There are even lids that you can put on top of the cups to save the juice for later!